Antique glass doorknobs are treasures from days gone by and are actively sought today by collectors and restorers alike. The history of these beautiful bits of our past begins with the technological advances of the early 1800s. Glass doorknobs are still being manufactured, but the look and feel of the glass is distinctly different than the antique and vintage versions. The old glass knobs look watery when compared with today's crystal-clear reproductions. The technology for pressing melted or molten glass into molds was developed in 1826. Glass knobs were made then, but they did not become popular until after 1917 when the United States joined World War I. Metals that had been previously used for doorknobs, such as iron, brass and bronze, were needed to manufacture airplanes and other necessities for the war. By 1920, doorknobs made from crystal and cut glass were widely manufactured and sold. Glass doorknobs remained popular until Americans' preferences reverted back to metals in the 1950s. Today, the use of art glass in doorknobs is an expensive design choice, compared with the mass-produced hardware store variety. 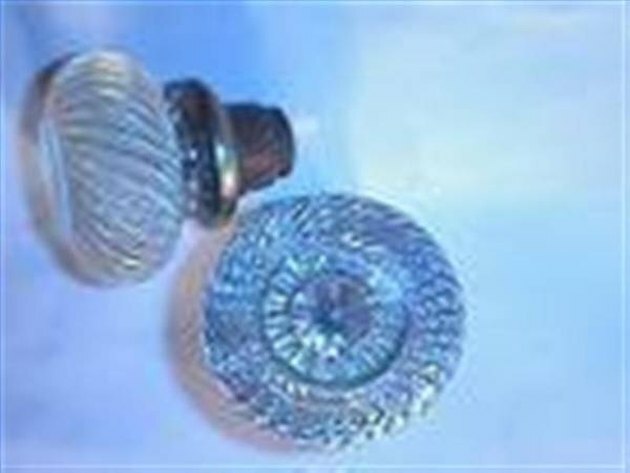 Most of the antique and vintage glass knobs manufactured were clear, and colored glass was used less frequently. Cobalt blue was a popular color, along with a lighter robin's egg blue. Green, violet, red, Vaseline glass and white milk glass were made more sparingly. If you're shopping for a bit of history for your home, you can find antique and vintage glass doorknobs starting at around $20 per pair for the more common 12-sided clear glass models. Cut crystal balls are the most expensive as they are the most difficult to find. Prices for these sets can be as much as $500. As with any antique or collectible, the more rare a style or color is, the more you can expect to pay. Cobalt, red and Vaseline glass knobs are the most prized colors for antique and vintage knobs. Condition is also a consideration as you will find some with chipped or broken glass, which is nearly impossible to repair. Historically, glass knobs had 6, 8 or 12 facets. The available shapes ranged from globes to ovals, and you could clearly see the particular star, pinprick or bullet designs that were made into the base of the glass knob. Today's reproductions are made from lead crystal and, though they are beautiful, you will see a difference if you look at the old and new, side by side.